If you were going to create a perfect Saturday afternoon for baseball, chances are good it would look a lot like St. Louis did yesterday afternoon — bright blue skies, sunshine, temperature of 83 degrees at 3 p.m. on July 19. Of course you’d want a really compelling match-up to go with your perfect afternoon, like two teams battling for the top spot in their respective divisions. All those elements came together yesterday, with the 54-44 tied-for-first-in-the-NL-West Dodgers and the 53-44 one-game-behind-the-Brewers-in-the-NL-Central Cardinals doing battle. Since it’s a Saturday home game, the Cardinals are wearing their alternate uniforms (which just add to the perfect day ambiance even more). Plus, to make it even better for people like me who will take any available television option besides Dan McLaughlin on FOX Sports Midwest, the game is being broadcast on FOX Sports 1 with Kenny Albert and Eric Karros announcing — in addition to FOX Midwest with McLaughlin and Tim McCarver. Oh, and this game just happens to be the United Cardinal Bloggers annual progressive game blog — and I’m leading off the coverage with the first inning. Yes, the Dodgers and Cardinals are back at it again after Friday night’s 3-2 Cards win in which Matt Holliday drove in all three runs with a double and home run, Kolten Wong scored the two runs Holliday didn’t, Lance Lynn allowed two runs and struck out nine, and the bullpen — Seth Maness, Pat Neshek and Trevor Rosenthal — threw three scoreless innings and allowed just one hit. In addition to the bright blue sky and sun, the green of the field looks extra vibrant on the FOX 1 telecast — much more than on FOX Midwest, as I had to change the channel and check once I noticed. Hmmmm, guess FOX 1 has some super-duper extra-green camera. The starting pitchers, Zack Greinke and Joe Kelly, have faced each other before — last October, to be exact, in Games One and Five of the NLCS. Game Five was the last time Kelly faced the Dodgers, while Greinke started against the Cards three weeks ago today in Los Angeles. Here’s to a better performance from Kelly, as he gave up four earned runs that last game and was the losing pitcher, and a worse one from Greinke, who gave up one run, four hits and struck out 10. In fact, Eric Karros tells us, Greinke’s last nine starts against the Cardinals have resulted in an 8-1 record and 1.91 ERA. Then we’re told that since Michael Wacha’s last start on June 17, Adam Wainwright and Lance Lynn have gone 6-3 with a 1.88 ERA (and team has gone 7-3) while all the other starters are 2-7 with a 6.85 ERA (although the Cards have gone 6-9). Which includes Kelly’s start last Saturday against the Brewers, his first since going on the disabled list in April, and he allowed six earned runs in three innings (but was settling in and improving by his third inning — and the Cards did win the game). Anyway, FOX Sports 1 has set their storyline — now we can cue the “that’s why they play the games” cliche … and play ball. 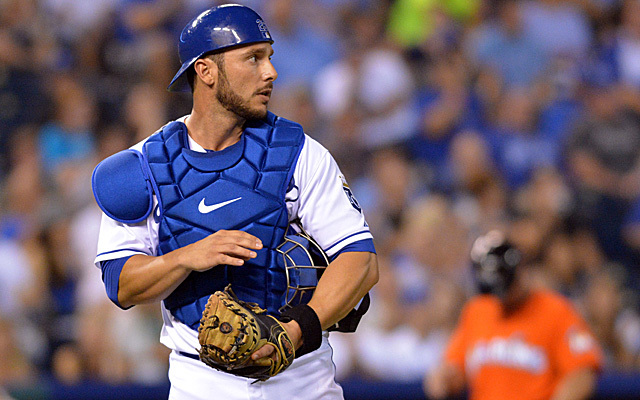 George Kottaras is making his first start behind the plate for the Cardinals, with Dodgers All-Star second baseman Dee Gordon stepping in to lead off.On a 2-1 count, he loops it into the extra-green grass of centerfield for a single that Jon Jay runs in to pick up. Gordon leads the majors in steals with 43, so the obvious comment from Albert and Karros is that he will no doubt be testing out Kottaras since — duh — George is no Yadi. We also get an in-depth explanation of the protector that Gordon puts on over his right hand that shields his fingers and wrist as he dives back into first or into second or whatever. Joe throws over to first base three times before even delivering a pitch to Carl Crawford — and Crawford is either lulled into a “please ground into a double play” trance while watching all those throws Kelly made over to first or getting drowsy from that long explanation of Gordon’s hand/wrist protector Karros gave. Because once Joe finally throws to the plate, Crawford is so surprised he grounds it directly to Wong at second. Kolten throws to Jhonny Peralta, who then throws to Matt Adams. Four-six-three double play. Good-bye for now, Dee Gordon and your protector. Which brings up Yasiel Puig. Despite his performance in the Home Run Derby this week, I was surprised to learn he has not had a home run since the end of May — just one homer in his last 164 at-bats. And he quickly swings at the first two pitches Joe throws. Yet Joe has a little trouble finding the strike zone on the next four pitches and walks Puig. No bat flip — he just tosses it toward the dugout and makes his way to first. Next is Hanley Ramirez, and Joe’s first pitch to him is a ball also. 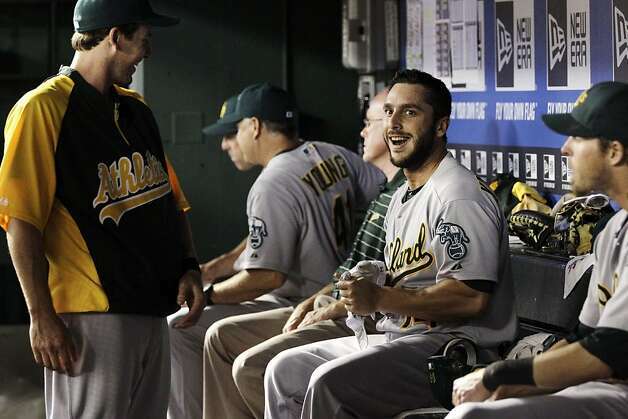 After strike one, we have to listen to Karros tell us Joe is the one who knocked Ramirez out of the NLCS. “First at-bat, first inning, hit him right in the ribs.” Thankfully, Hanley hits the next pitch to Matt Carpenter at third to end the inning and shut Karros up. Fourteen pitches for Joe Kelly as he allows one hit and one walk. Greinke is on the mound for the bottom of the first, with Matt Carpenter leading off for the Cards as usual. Karros tells us that for Greinke to be successful, he can’t let Carpenter, Wong or Holliday beat him. Hmmmm … let’s see how that will work out for Zack. After being down 0-2, Matt C works his way into a walk after eight total pitches. Even before the eighth pitch is thrown, Karros praises Carpenter for all the pitches he is making Greinke throw. And Kolten Wong makes him throw five more, as Greinke starts him out with two quick strikes also. Wong grounds it very softly between first and second and while Greinke tries but fails to field it, Gordon fields it and then makes an off-balance throw wide of first base. Matt C winds up at third, Kolten at second on the single plus error to extend his hitting streak to eight and up steps the Cards hottest hitter in the second half, Matt Holliday. With the sunlight glinting off his batting helmet, he retains that hottest hitter title — lacing it over Ramirez into the overly green left field grass. Matt C easily scores, Wong does also as Crawford has a little trouble fielding the ball and Matt H is at second. That five runs scored in two games for the Cardinals so far — and five RBI by Mr. Holliday. Remember when the Cards had trouble on offense? Was that all just a first-half dream? With Matt Adams stepping in, Matt H finds himself leaning a little too far off second — Greinke throws back to Ramirez, Holliday dives back to the base but hits his head on Hanley’s knee and Matt seems dazed as he sits on the ground for a moment before the trainer plus Jose Oquendo and Mike Matheny come over to check on him. Meanwhile, Karros speculates on what he thinks the injury is ”maybe he’s got something in his eye,” “a finger, maybe a shoulder,” then concluded that Matt collided with Hanley’s elbow as Matt is pointing to his head. Still, for all the chatter, he’s so much better than listening to Danny Mac. Adams is now back in the batter’s box, Greinke is ready and delivers — and Matt quickly drives it into the right field bleachers, scoring Matt … with Matt second in the receiving line back in the dugout. Matt Attack! Four batters, now 4-0 Cardinals! I’m sorry, Kenny Albert and Eric Karros, what were those numbers again on how Greinke has done is his last nine starts against the Cardinals? Jhonny Peralta flies it to left-center, which Crawford fields for the first out — on the 19th pitch thrown by Greinke. That brings up Oscar Taveras, as Kenny Albert tells us the most runs Greinke has allowed in a start all season is five. Perhaps the Cards can take that as a challenge, although they won’t make any progress toward another run with Oscar hitting it right in front of home plate for the second out. We are finally told what the Dodgers defense is — apparently there was no time to do so yet, despite the fact six batters have come up for the Cardinals and four got on base and scored. Somehow, Scott Van Slyke is on there twice playing centerfield and Carl Crawford is nowhere to be found. Boy, that error on Holliday’s hit really had consequences. 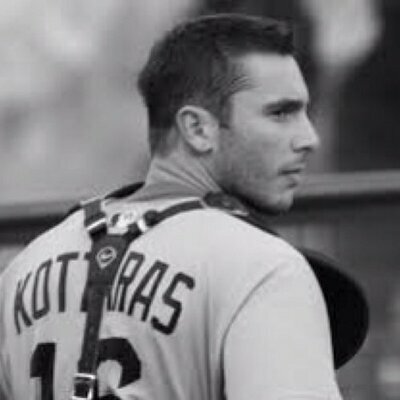 Next up: George Kottaras. Hello, George. There are some portions of Cardinal Nation who are very happy to see you as a Cardinal. Well, OK, they’re really just happy to see you. Period. This picture has been making the rounds on social media, because George with a dog? Awwwwww! If you’d prefer George pet-less, here you go. And there’s this. Plus this one. Also this one. A variety of uniforms in those photos, as the Cards are George’s seventh team. Meanwhile, Greinke walks him. Jon Jay, who is 7 for 19 lifetime against Greinke according to Albert, grounds the 31st pitch thrown to Gordon at second. He fields it, throws to first and just gets Jay to end the inning. To recap the Cards half of the first: four runs on three hits with two Dodger errors add up to one entertaining inning to watch. For a look at how the second inning unfolded, head over to Cardinals Nerve Center for Dan Buffa’s recap. Then check out the rest of the innings from the UCB’s progressive game blog page. Tonight, we’ll see if the Cardinals can sweep the Dodgers (do I need to add a spoiler alert that they did win yesterday, 4-2?) on ESPN’s Sunday Night Baseball. Clayton Kershaw will start against Carlos Martinez. This entry was posted in 2014 Cardinals and tagged George Kottaras, Hanley Ramirez, Jhonny Peralta, Joe Kelly, Jon Jay, Kolten Wong, Los Angeles Dodgers, Matt Adams, Matt Carpenter, Matt Holliday, Oscar Taveras, Zack Greinke by Christine Coleman. Bookmark the permalink.